Posted on October 18, 2016 , in Hot Tubs. An energy efficient hot tub is truly a game changer. It provides all of the stress reduction and entertainment benefits you’re looking for while saving you money. Because all hot tubs are not equally energy efficient, it’s important that you know which features to look for that will maximize your energy savings. Below, you’ll find out how to find the perfect energy efficient hot tub for your lifestyle. 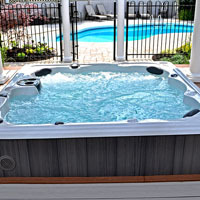 A hot tub that can quickly filter water will always provide exceptional energy efficiency. Before you invest in a hot tub, find out how long it takes to filter all of its water. As an example, Hydropool hot tubs, which are among the most energy efficient on the market, will filter 100% of your hot tub’s water in only 15 minutes. High-quality hard covers are among the best ways to save energy. The best covers are durable and keep heat locked in while keeping cold air out. To enhance heat retention even further and keep your water hotter for longer, choose a hot tub with a tapered design, locking hard cover, and insulated baffles. Hot tubs can easily lose heat around the piping, flooring, and cabinets. Energy efficient hot tubs are designed with advanced technologies that retain as much heat as possible. As an example, Hydropool utilizes a Triple Thermal Shield Blanket inspired by NASA technology to keep heat in. For the best in energy efficiency, you’ll want to be on the lookout for these types of cutting-edge features. Many hot tub pumps consume excessive energy, but if you choose one with a low energy output and a high flow rate, you can actually save money. For example, a Hydropool pump is 25% more efficient than most other pumps. The most efficient hot tubs are able to retain waste heat from the water pump and send it back into the hot tub’s cavity. Adjustable venting is one of several features that can assist with this process. Look for the latest innovations like Hydropool’s Triple Thermal Shield blanket and Hydrowise vents. When you want the most energy efficient hot tub around, look for California Energy Commission (CEC) approval. The CEC has stringent guidelines for energy efficiency, so a CEC approved hot tub will always maximize your energy savings. As one of the first CEC approved hot tubs, running a Hydropool hot tub at 100 degrees Fahrenheit costs only a few cents a day.